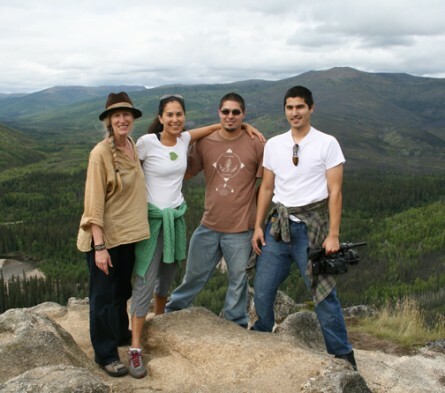 In August 2008, we journeyed to the Arctic Circle in Alaska to direct our prayers to “The Sacred Place Where Life Began,” the ancestral homeland of the Gwitch’in people. We went there to bury the 20th Earth Treasure Vase and were hosted by former Gwitch’in Tribal Chief, Evon Peter and his family. Today, oil and gas development and production threatens the Gwitch’in lands, known to the world as the Arctic National Wildlife Refuge. We stopped first to see beloved Grandmother Rita Blumenstein, a Yup’ik elder and healer who is a member of the International Council of 13 Indigenous Grandmothers. When Rita heard about the practice of the Earth Treasure Vases, we were stunned to receive from her two white eagle feathers from the medicine fan she carries. This fan is made from 13 white eagle tail feathers and it was given to Grandmother Rita by her own grandmother when she was only 7 years old. She also was informed at that time that she would become a member of the Council of 13 Grandmothers. This prophecy did not come true until Rita was in her 70’s. Southern Pacific rises all the way up to the Arctic. 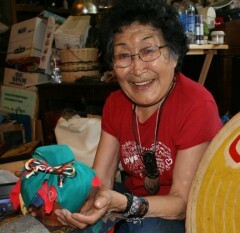 We visited Rita in her Anchorage home where she offered her prayers and blessings into the vase and then we continued up to Fairbanks where we met with Evon Peter and his family to bury the ETV in the Arctic north. and Indigenous Leadership, and agreed to host us in his homeland. We were honored that his mother, brother and sister all joined the pilgrimage along with several other friends. We traveled up the Dalton Highway to the family’s traditional fish camp on the Yukon River where we camped. The day of our closing ceremony with the vase a gigantic bald eagle flew into the camp, perched on a branch watching us, then dropped an almost 3 foot long wing feather onto the ground as a offering! The next day we drove many miles further north until we found a good area to bury the vase. We walked into that vast landscape and dug a hole. The soft lichen and moss-covered tundra that is feeding grounds for the caribou, received the vase into its fragrant soil. As we finished planting the vase and began to make our way back to civilization, a double rainbow appeared as an auspicious blessing, followed by the full moonrise that hovered huge and yellow for hours on the horizon. Driving through the darkness later, a rare lynx came out of the woods, joining bear, moose, owl, eagle, and weasel in the animal community that blessed our journey. is essential to their way of life as they sustain themselves on the caribou who also live there. The calving grounds of the caribou are known as The Sacred Place Where Life Begins. Adeline, who is the matriarch, became my close heart friend; she honored me by calling me her “blood sister.” She and I are the same age (1946 Grand Cru). 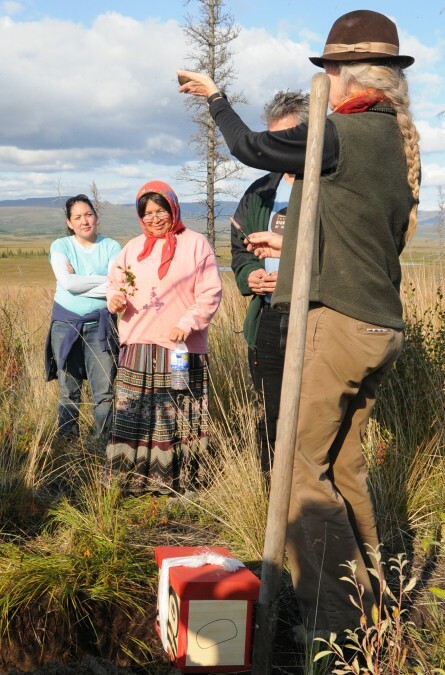 We drove up the Dalton Highway from Fairbanks in three cars to the Yukon River where Adeline has a traditional fish camp to harvest salmon, hunt, grow a garden and gather the wild foods of the land. Much of the road is unpaved and rocked by huge trucks bringing supplies to and from Prudhoe Bay, the big oil refinery at the Arctic Ocean past the Brooks Range at the end of the road. 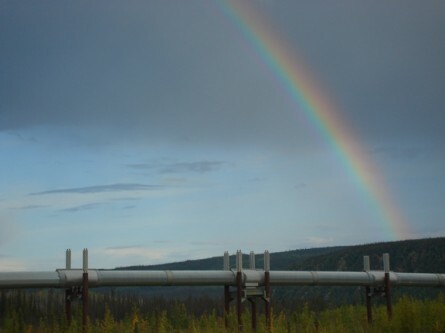 The Trans-Alaska Pipeline was our constant companion. We stopped frequently to gather wild blueberries by the handful. Most of all, we began to bond by laughing at everything and nothing. The Yukon River is as large as the Amazon. Although the weather channel had predicted rain, rain, rain for our stay, we were blessed by clear and dry weather. At the Yukon Bridge we made several trips by boat downriver to Adeline’s camp. Everyone tenderly laughed at me, as I had never camped before! I clung to my brand new sleeping bag, my two bottles of Deet, and my face net! I was terrified of the fierce Alaskan mosquitoes. When we arrived at the clearing that is Adeline’s fish camp she started the fire that would burn for three days. We were all aware that we were here to participate together in ceremony. At night, after eating caribou and moose stew and salmon fishtail soup, we prayed for the protection of this stunning land. The Earth Treasure Vase brought all the way from Nepal by Cynthia Jurs is filled with leaves and twigs and stone from the land. On the last evening, in our final ceremony before sealing the vase, I place a small vial containing 3 drops of gasoline, a homeopathic dose of guilt-humbling prayers for forgiveness, and an ancient piece of Walrus ivory tusk given to me by a friend in the vessel. Both offerings are meant to return to the Earth what we have taken from her. On the 16th of August, the day of the full moon, we packed up and drove further up the Dalton Highway to the Arctic Circle, where we gathered for a quintessential group photo, waving away the legions of blood thirsty mosquitoes. (By then I was practically swimming in pure Deet, well aware that death by chemicals is no better than a few mosquito bites!). Evon and Cynthia scouted for a good place to bury the Vase. The relentless pipeline is always there, lining the road and cutting through the wilderness like an endless patriarchal-dominator reminder. When we stopped our little caravan along the highway to listen to the instructions from the land, government cars arrived and parked across the road. The pipeline protection squad, we imagined. Adeline knew where the Vase would be safe. She knows this place like a caribou from the Porcupine herd that migrates here. Near Finger Rock, we parked the cars and descended with shovels and Tibetan medicines, deep down into the tundra, feet sinking into a soft carpet of dry moss. The men dug into the arctic ground, 6 feet deep; several of us cried softly as we placed our offering into the Earth. Cynthia recited mantras. I asked that the madness stop, I asked that more and more of us become “future primitives.” We were in a circle of surrender to the land. 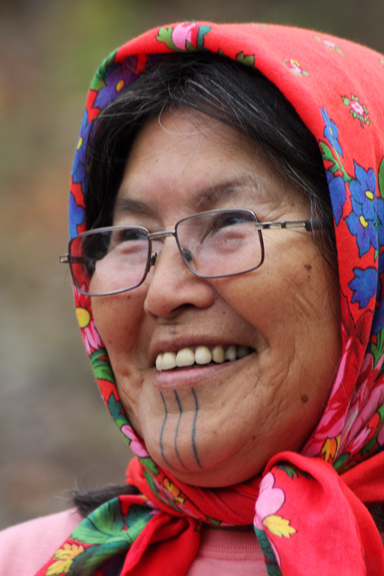 Evon sang a Gwich’in song of gratitude to the caribou. We passed the eagle feather from hand to hand. And then it was done, nothing but stillness. We performed a liturgy with the landscape. On the way back to Fairbanks I was tucked in the backseat of the car beside Adeline. We witnessed an immense rainbow and then the long sunset lingering over this stunning immensity. The full moon rose gigantic and hovered on the horizon for many hours as we drove the long haul back to “civilization”. I knew like never before, that what we share as humans is much greater than what separates us. The auspicious rainbow that appeared after the burial of the vase. In the foreground is the Trans-Alaska pipeline that carries the oil mined in this region. This entry was posted on Thursday, November 26th, 2009 at 2:50 pm	and is filed under Burials. You can follow any responses to this entry through the RSS 2.0 feed. You can trackback from your own site.